Sweaters are an expensive investment helping you manage through the harsh and cold winters. Opting for the best ways of keeping the material of your sweaters intact can help them last for years while providing the same warmth and comfort to you. Once you have mastered the art of washing sweaters in the right manner, it is time for you to practice safe drying techniques that won’t harm the integrity of the material. Sweaters are prone to shrinking and intense damage when exposed to excess sunlight. Moreover, many materials used in sweaters might stretch out when you hand them out in the sun especially in the region such as sleeves. Having clothes drying stand at home for sweaters can be beneficial when you are trying to dry off your clothes with pouring rains outside. Here are some of the benefits of opting for sweater drying rack at home. With clothes drying stand, you get access to additional space for drying off your sweaters and don’t have to squeeze in the clothes for some extra space. You can essentially make more space by unfolding the stand as per your requirement. If you are planning on getting done with the entire month’s cleaning requirements, you can easily do so by getting a stand that can add space for drying off the sweaters inside the room. With instant access, you can easily rotate the sides to make sure the clothes are dried off evenly. Now some of us may be okay with the idea of washing the sweaters only after wearing them for certain duration. However, some cleanliness freaks might not be okay with the idea and might want to wash it off every time after wearing them. However, woolen clothes do not get dirty as easily as other clothes which is why it is okay to wash them after wearing a few times unless you have managed to spill anything on it which is showing off vividly with no way to hide it. Unless that is the case, make sure you bring down the average of washing clothes. Chemicals used to wash the sweaters when exposed multiple times can damage the material leading to a reduction of the life of the sweater. Make sure you wash it only when needed and dry it off away from the sun on the clothes drying stands to keep it from crumbling while keeping it soft and cozy. The best way to save the fabric from getting worn out is to opt for the best method to wash the sweaters by taking a look at the fabric. Make sure you read through the label to confirm whether it is pure wool, or mix, or something else. Plan a washing cycle accordingly that can keep the material intact without ruining the integrity. Sweaters made from cotton can easily be washed in some cool water while the ones made from acrylic needs to be washed with luke-warm water. Wool, as well as cashmere, is both a delicate material that requires soft water with no extreme temperatures to be washed. When trying to dry out the sweaters, use clothes drying stand to ensure that they aren’t exposed to extreme temperatures. You can switch on the fan to make sure they dry out at a faster pace. After washing out your sweaters, make sure you squeeze out the extra water before you go ahead and spread them out over the clothes drying stand. However, you need to keep in mind the fact that spreading out the clothes without squeezing the extra water will make your floor wet when the water drips down on the floor. This leads to some extra work that takes up a lot of time and effort on your behalf. 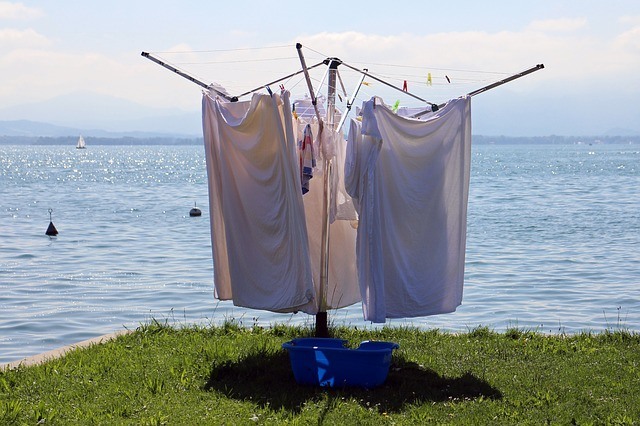 After you squeeze out the extra water to avoid any kind of dripping, you can hang them over on the clothes drying stand and save a lot of extra effort. But before you do that, you need to keep in mind the fact that sweaters are very delicate and need to be handled with care. To ensure that the intensity at which you squeeze the same doesn’t harm the material or stretch it so far that it becomes too loose for you to wear. Piling up your sweaters one over the other can lead to impractical arrangements that lead to a lack of proper ventilation among the sweaters which slows down the process of drying. If it is raining outside and you have run out of places to dry off your clothes, the best thing you can do it take out clothes drying stand in any of the rooms inside your house and dry off the clothes over them. Take some time and hang them one by one to ensure that each piece of sweater gets ample space to dry off quickly. When you pile up one sweater over the other, you leave no space for the moisture in the sweaters to evaporate. Allow maximum amount of air to circulate between the sweaters to ensure that they dry at a faster pace. When looking for methods to dry out your sweaters in a faster pace, make sure you find the hottest place in your house. Look for places such as radiator or boiler to ensure that the warmth of the source dries off your sweaters within minimum possible time. You can also look for places inside your home that is exposed to maximum air flow such as a place near the window or close to the fan. This ensures that the moisture in the sweaters evaporates at a faster rate. Make sure you keep rotating the clothes at the right time to ensure it dries off evenly. However, one thing you need to keep in mind is the fact that you need to keep away the sweaters from sources with excess heat which can deteriorate the material’s integrity when hanging it over the clothes drying stand.